We are grateful for all the support and encouragement we have received from so many individuals and organisations. We want to thank everyone for their encouragement, help and donations. There have been some very special contributions. Many people have given what they can afford some have given more than they can afford. It would be impossible to record here every contribution in money and in kind which has been made. We have therefore decided to record here the names of those who have contributed £10 or more to the Banner Fund. Their details are listed below but there aremany more who specifically asked not to be listed. Levinia (79) is a Seaham pensioner and was the first to make her contribution to the Banner Fund. Her £30 contribution is a lot of money for a pensioner but she was determined to support the miners as she always has. She said "The banners have lasted well but if they are shabby they need to be replaced - they can't last forever. Levinia was brought up by her grandparents from being a baby and was always surrounded by miners and mining people. Her grandfather was Jimmy Hoy who was Secretary of Seaham Colliery NUM Lodge for 40 years before he died in 1936. Levinia recalls being serenaded by Seaham Colliery Band outside of the shop where she worked as they returned from Durham Big Meeting. 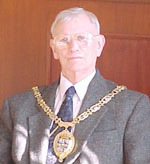 John Richardson John is the Chairman of Durham County Council and is a good friend of Seaham Harbour. He too was amongst the first contributors and his contribution of £50 from his own resources and his unstinting support for our £25,000 project deserves recognition. John says, " The industrial history of County Durham must be maintained through the medium of the miners lodge banners which were the benchmark of the communities of our county."